Annual or perennial herbs, or tall woody bamboos. Flowering stems (culms) jointed, internodes hollow or solid; branches arising singly from nodes and subtended by a leaf sheath and 2-keeled prophyll, often fascicled in bamboos. Leaves arranged alternately in 2 ranks, differentiated into sheath, blade, and an adaxial erect appendage at sheath/blade junction (ligule); leaf sheath surrounding and supporting culm-internode, split to base or infrequently tubular with partially or completely fused margins, modified with reduced blade in bamboos (culm sheaths); leaf blades divergent, usually long, narrow and flat, but varying from inrolled and filiform to ovate, veins parallel, sometimes with cross-connecting veinlets (especially in bamboos); ligule membranous or a line of hairs. Inflorescence terminal or axillary, an open, contracted, or spikelike panicle, or composed of lax to spikelike racemes arranged along an elongate central axis, or digitate, paired, or occasionally solitary; axillary inflorescences often many, subtended by spatheoles (specialized bladeless leaf sheaths) and gathered into a leafy compound panicle; spikelets often aggregated into complex clusters in bamboos. Spikelets composed of distichous bracts arranged along a slender axis (rachilla); typically 2 lowest bracts (glumes) empty, subtending 1 to many florets; glumes often poorly differentiated from accompanying bracts in bamboos. Florets composed of 2 opposing bracts enclosing a single small flower, outer bract (lemma) clasping the more delicate, usually 2-keeled inner bract (palea); base of floret often with thickened prolongation articulated with rachilla (callus); lemma often with apical or dorsal bristle (awn), glumes also sometimes awned. Flowers bisexual or unisexual; lodicules (small scales representing perianth) 2, rarely 3 or absent, 3 to many in bamboos, hyaline or fleshy; stamens 3 rarely 1, 2, 6, or more in some bamboos, hypogynous, filaments capillary, anthers versatile; ovary 1-celled, styles (1 or)2(rarely 3), free or united at base, topped by feathery stigmas, exserted from sides or apex of floret. Fruit normally a dry indehiscent caryopsis with thin pericarp firmly adherent to seed, pericarp rarely free, fleshy in some bamboos; embryo small or large; hilum punctate to linear. Grasses are present throughout China, but the largest area of natural grassland lies in the northern part of the country, forming part of the temperate Eurasian steppe. Much of this area has now been converted from rangeland into farmland with wheat (Triticum) as the major food crop. The moister grasslands of northeast China support forest steppe, the dominant natural grasses being Leymus chinensis and Stipa grandis. The climate becomes progressively drier eastward, supporting steppe and semidesert steppe. Species of Stipa are dominant, with Agropyron, Cleistogenes, Koeleria, and Leymus. Common grasses of the dry alpine steppe of the high Xizang-Qinghai Plateau include species of Elymus, Festuca, Leymus, Poa, Puccinellia, and Stipa. Desert grasses of northwest China include sand-binding species of Aeluropus, Cleistogenes, and Orinus. 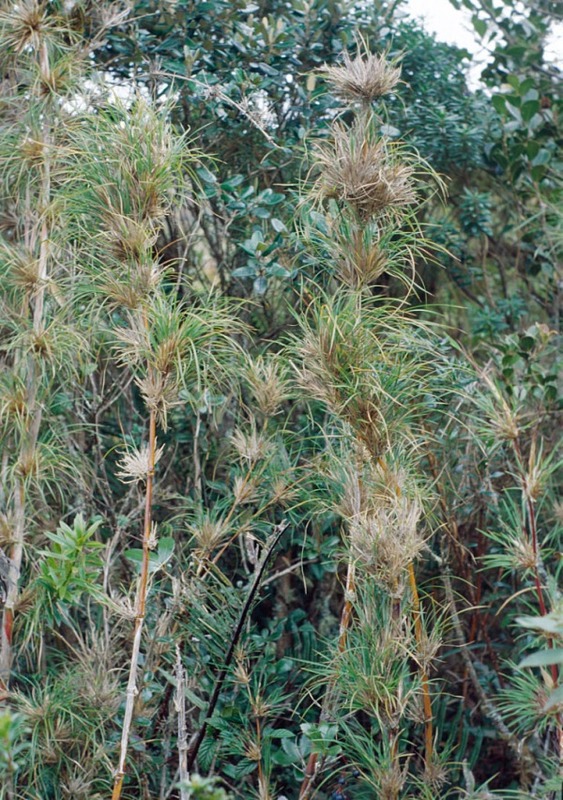 In warm, subtropical areas of southern China widespread tropical genera are well represented, including Cymbopogon, Digitaria, Eulalia, Paspalum, Pennisetum, and Setaria. The major food crop here is rice (Oryza). Other tropical genera with their center of distribution in southeast Asia extend into China, including Arundinella, Isachne, and Microstegium. Extensive pure stands of Phacelurus latifolius are found in coastal salt marshes, as are introduced species of Spartina. Phragmites species form large colonies in the shallow margins of inland lakes and rivers. The subfamilies of Poaceae are not included here, as they are largely based on non-morphological characters that are not readily available for identification purposes. However, the traditional grass tribes, as broadly accepted over the last two decades, do mainly have a morphological expression, backed up by characteristics of anatomy, embryology, and other cryptic characters. With practice and increasing familiarity with the family, it is usually possible to assign an unknown grass to a tribe without undue difficulty. The tribe is therefore taken as the primary division here. Modern molecular systematic studies are providing new insights into grass relationships. This new information has been incorporated where it has proved possible to link it to morphology, mainly by the separation of Danthonieae from Arundineae and the repositioning of a few individual genera. However, where the new information leads to the redefinition of tribes, or the genera within them, on grounds not easily expressed morphologically, the traditional treatment has been retained. Aveneae are upheld as distinct from Poeae, and Eragrostideae as distinct from Cynodonteae, because they are usually easily recognizable and hence useful for identification. Grass taxonomy is at present undergoing a period of rapid modification. The incorporation of molecular data into the classification scheme is incomplete, alterations are ongoing, and a new system with overall acceptance has not yet emerged. The primary purpose of a Flora is to provide an identification guide, usually for the non-specialist, and it must therefore be based mainly on morphology. Those interested in the latest research and new ideas on grass relationships can find more detailed information in the taxonomic literature. The following is recommended: Columbus, J. T. et al., eds. 2006. Monocots: comparative biology and evolution. [Aliso, 2 volumes]. Rancho Santa Ana Botanic Garden, Claremont. Extensive use has been made of Genera Graminum by Clayton and Renvoize (1986) during the preparation of this volume. In particular, Chen Shouliang and Sylvia Phillips have used the key to tribes and the tribal descriptions there as the basis for those in this volume. The names of the Chinese agrostologists Sun Bixing and Liu Liang are abbreviated as "B. S. Sun" and "L. Liu" in this volume, but the alternative abbreviations "B. X. Sun" and "L. Liou" occur sometimes in other literature. The bamboo specialist Xue Jiru (Hsueh Chi-ju) is abbreviated as "Hsueh" in this volume because he always gave his name as "Hsueh" as the author of plant names, regardless of any different spelling used for him as the author of the works in which the names were published. 1. Institute of Botany, Jiangsu Province and Chinese Academy of Sciences, Nanjing Botanical Garden, Mem. Sun Yat-Sen, Zhongshan Men Wai, Nanjing, Jiangsu 210014, People’s Republic of China. 2. Kunming Institute of Botany, Chinese Academy of Sciences, Heilongtan, Kunming, Yunnan 650204, People’s Republic of China. 4. Northwest Plateau Institute of Biology, Chinese Academy of Sciences, 59 Xiguan Street, Xining, Qinghai 810001, People’s Republic of China. 6. Department of Biology, Nanjing University, Ling-Hai-Rou, Nanjing, Jiangsu, People’s Republic of China. 8. Dendrological Herbarium, Forest Resources and Environment, Nanjing Forestry University, Longpan Road, Nanjing, Jiangsu 210037, People’s Republic of China. 10. Institute of Biology, Guizhou Academy of Sciences, Xiaohe, Guiyang, Guizhou 550009, People’s Republic of China. 11. Dendrological Herbarium, Department of Forestry, Jiangxi Agricultural University, Meiling, Nanchang, Jiangxi 330045, People’s Republic of China. 12. Herbarium, Royal Botanic Gardens, Kew, Richmond, Surrey TW9 3AE, United Kingdom. 13. United States National Herbarium, Department of Botany, National Museum of Natural History, MRC-166, Smithsonian Institution, P.O. Box 37012, Washington, DC 20013-7012, U.S.A.
14. National Herbarium of Canada, Research Division, Canadian Museum of Nature, P.O. Box 3443, Station D, Ottawa, Ontario K1P 6P4, Canada. 15. Herbarium: Higher Plants, V. L. Komarov Botanical Institute, Russian Academy of Sciences, 2 Prof. Popov Street, St. Petersburg 197376, Russia. 16. P. N. Krilov Herbarium, Tomsk State University, Prospect Lenina 36, 634050 Tomsk, Russia. 17. Botanical Garden, University of Bern, Altenbergrain 21, CH-3013 Bern, Switzerland. About 700 genera and 11,000 species: widely distributed in all regions of the world; 28 tribes, 226 genera (seven endemic), and 1795 species (809 endemic) in China.